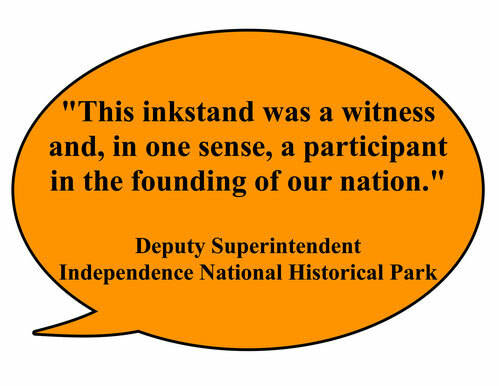 On August 2, the Syng Inkstand took part in the birth of our nation. On that date, the delegates to the Second Continental Congress, men we now call our Founding Fathers, dipped quills into this inkstand and signed their names to the Declaration of Independence. These signatures produced from the inkstand were proof that they were traitors in the eyes of some men, and patriots in the eyes of others. 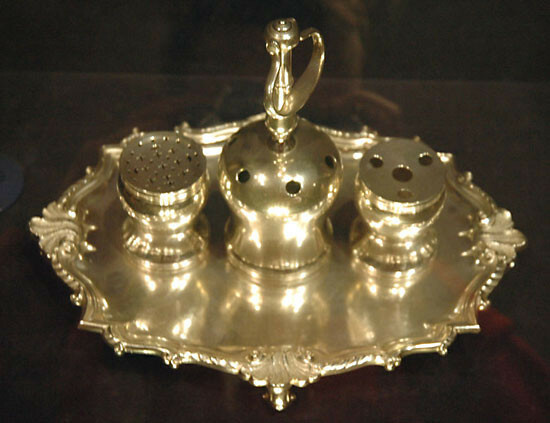 Eleven years later this same inkstand was used on September 17, 1787 to sign the newly written Constitution of the United States. This inkstand was a witness and, in one sense, a participant in the founding of our nation. Many of the men who signed the Declaration of Independence lost their fortunes, their homes, and their lives because they signed the document. Would you sign it? Why did these men use an inkstand and write with feathers? What documents in your life need signatures to make them official? Why is it called the Syng Inkstand? Science: This silver inkstand is now stored in a case with the oxygen removed. Why? History: George Washington did not sign the Declaration of Independence. Why not? Math: This inkstand was made in 1752. How old was it in 1776? How old was it in 1876 when it was last used?